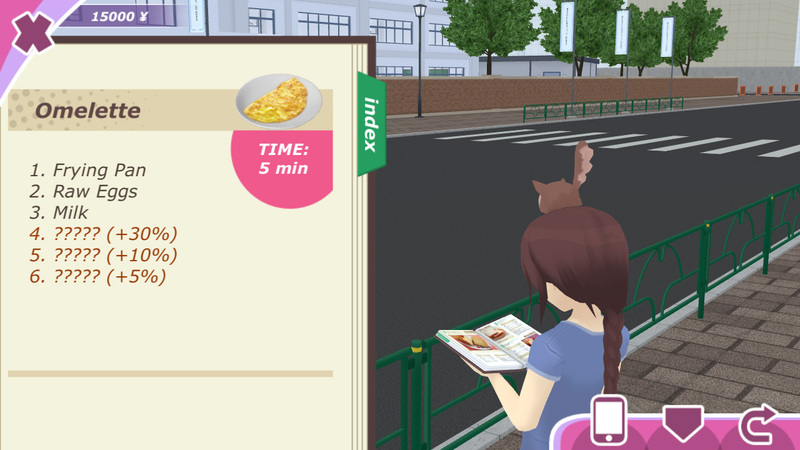 A recipe book is coming in alpha 0.3 update! Now you won’t have to feed your girlfriend by burned food any longer. I still wanted to leave some room for exploration and experimenting, so the recipe book will work as follows: in the beginning you’ll know all basic recipes, but with optional ingredients hidden. You’ll have to choose to cook either the basic recipe with lower quality, or attempt to add optional ingredients. Once you manage to cook something with 100% quality for the first time, the full recipe with all optional ingredients will be added to your book. If you have other ideas about improving cooking and recipe gameplay, please post them in the comments sections of this article! Ugghh….. I have a problem, can’t log in see your mail, help? I want to be your translator too, but my username kinda not detected? Help? [at] you mean @? Okay, then. That was a waste of an account. I couldn’t do anything with it. Thanks. Yes, you have to replace [at]. What do you mean by “waste of account”? You can’t send me an email? Welp, mother of god. I forgot to click reply, so I put the reply below, thanks! And sorry. It’s sold only in the Summer Town map. I’m so glad that you made the recipe book. Because when my girl asked for somefood that I don’t remember the name of it, I just couldn’t cook it and she looked so sad. YES THANK YOU SO MUCH. I Found a bug one day,When I found two squirrels they were stacked, Once i sold them i only got 500,I was kinda mad and sad, Please fix this that it wont happen to someone else. That bug existed in alpha 0.1 and was fixed already in alpha 0.2. You can sell them? How? Interact with a cash register on the counter in the convenience store. The one with the sign saying “squirrel exchange service”. Can you please help me im having difficulty and the recipe book wont open. What do I have to do to open it? Drag it from your inventory and drop on “hand” equipment slot. This is going to be long…. I hope you’re not getting bored. I’ve been created an account of wikimedia? Is that the name? And yeah, I used this username that I’m using right now. Because you said that if I want to contact you, you can check in http://wiki.shoujocity.com in the part FOR TRANSLATORS, right? When I went there, the pages says “You need to log in”, so in otherwise, I needed to create an account first. But the username always says error “There is no user by the name “[My username]”. Check your spelling.” So, I couldn’t see your e-mail at first, so yeah I went here needed your help. So, don’t worry about it. Thank you anyway, you’re nice. Yeah, that was my bad. Sorry about that…. yay now I don’t need to bye an apple or something when she asks for ramen or something. XD im not spending money on something I dont know how to make. There is a countdown until next update in the sidebar menu. It’s free. Download links are in the sidebar menu. I do not know your language, so I’m writing through Google. But where can I find this book recipe? This book will be available in alpha 0.3 update (will be released on October 12). I was going to ask about something else, but everytime I need more yen there is only one or two squirrels. is that a bug or is that supposed to happen. It’s supposed to work like that. Squirrels spawn in limited amounts, and after you catch five, they will stop appearing until next day. Thank you for reporting this bug! I found out already why it happens, will be fixed in alpha 0.3 update. Ира просто оболденная, спасибо что создали её. Можно ли будет заработать йени ещё как нибудь? По мере добавления новых локаций в них можно будет ловить новые более ценные виды белок. Кроме того, деньги можно будет зарабатывать работая в кафе напротив школы. Все это будет доступно в будущих обновлениях. А что будет если допустим собрать 5 белок и не продавать их, будут ли они на следующий день? How do i open the recipe book? By dragging and dropping it on your “hand” equipment slot.